By now your kids are probably over that back-to-school honeymoon phase, and getting them out of bed may be getting harder and harder as the school year trudges onward -- especially when all they have to look forward to at the breakfast table is the same old boring cold cereal breakfast. 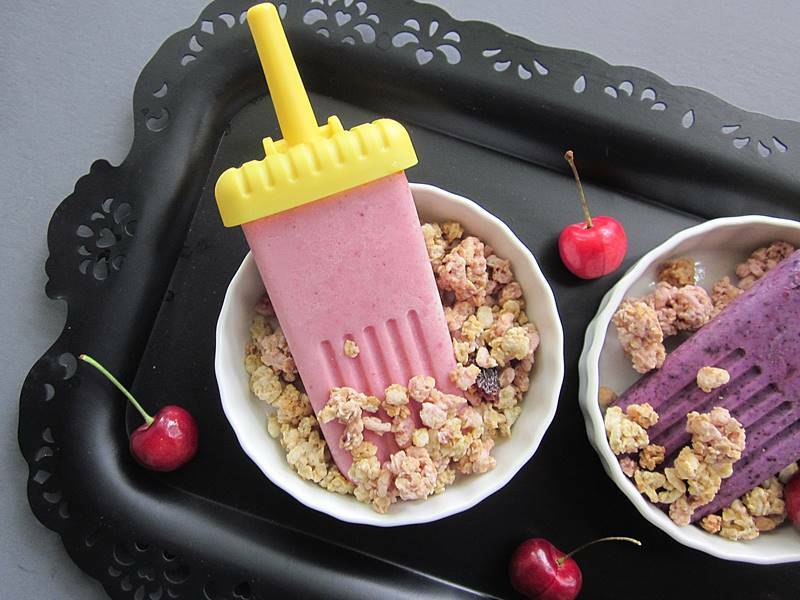 Luckily, you can sweeten up the morning with a surprise healthy breakfast of granola coated fruity yogurt popsicles. I can't promise you that homemade popsicles will make your kids jump out of bed perfectly happy and ready to go, but the lure of a special ice pop breakfast can sure make the day easier to face. Keep reading to learn how to make this easy and healthy breakfast treat. 1 cup of your child’s favorite organic vegan yogurt. 1 cup of your child’s favorite organic fruit washed and chopped. You can use one fruit or mix and match fruits, such as bananas and strawberries or peaches and blueberries. If you’d like to use a hard fruit like apples or pears, steam the chopped pieces lightly, until just soft, before blending. 1 tablespoon ground organic flax seed. 1/2 tablespoon organic wheat germ. 1/4 to 1/3 cup of organic granola per ice pop (don’t mix into the popsicles, save for serving). 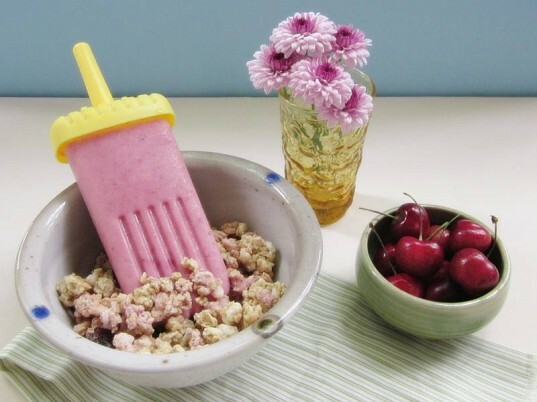 All you really need to make these breakfast ice pops is a good set of popsicle molds and a blender. I used Tovolo Groovy molds because my son is 12 years-old, so he can eat bigger popsicles. If you have younger kids, I suggest using a smaller sized mold like the Tovolo Rocket Molds shown above. See some tips and tricks related to choosing popsicle molds and facts about making homemade popsicles. This recipe will end up making about 4 to 6 popsicles. The amount you officially get will vary, depending on the size of molds you use and the amount of fruit you use. Blend your yogurt and fruit together in the blender until mixed well. Mix in the agave, ground organic flax seed and organic wheat germ. Once everything is blended well, pour the mixture into your ice pop molds. In the morning, take your popsicle or popsicles out of the freezer about 5 minutes before breakfast time. This allows your pops to become a bit soft, so when you dip the pop into the granola, it will stick. Keep in mind that huge chunks of granola won’t stick to the popsicles, so place the granola on a clean cutting board and run it over a few times with a rolling pin which results in smaller pieces which easily stick to your pops. Give your child a small bowl of crumbled organic granola then let him dip his pop into the granola and munch away. Serve with extra fruit on the side if you’d like. 1 cup of organic vegan yogurt. 1 cup of organic fruit washed and chopped. 1/4 to 1/3 cup of organic granola per ice pop. 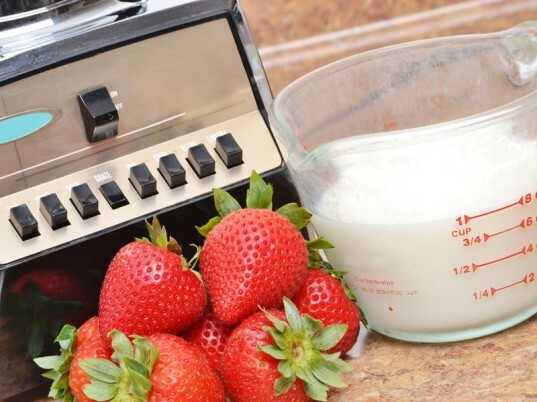 Blend your yogurt and fruit together in the blender. Mix in the agave, ground organic flax seed and organic wheat germ. Pour the mixture into your ice pop molds and freeze overnight. In the morning, take your ice pops out of the freezer and serve with small bowls of crumble granola for dipping. 1 cup of your child's favorite organic vegan yogurt. 1 cup of your child's favorite organic fruit washed and chopped. 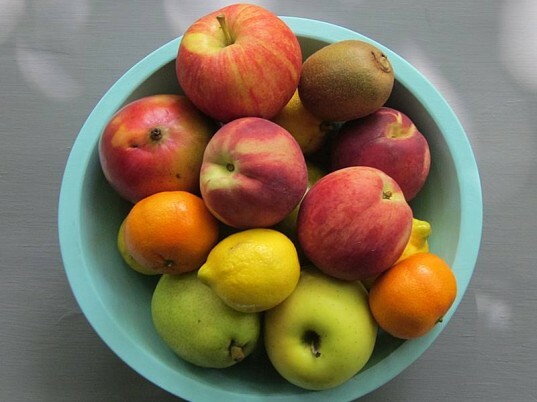 You can use one fruit or mix and match fruits, such as bananas and strawberries or peaches and blueberries. If you'd like to use a hard fruit like apples or pears, steam the chopped pieces lightly, until just soft, before blending. 1 tablespoon organic agave. 1 tablespoon ground organic flax seed. 1/2 tablespoon organic wheat germ. 1/4 to 1/3 cup of organic granola per ice pop (don't mix into the popsicles, save for serving). All you really need to make these breakfast ice pops is a good set of popsicle molds and a blender. I used Tovolo Groovy molds because my son is 12 years-old and he can eat bigger popsicles. 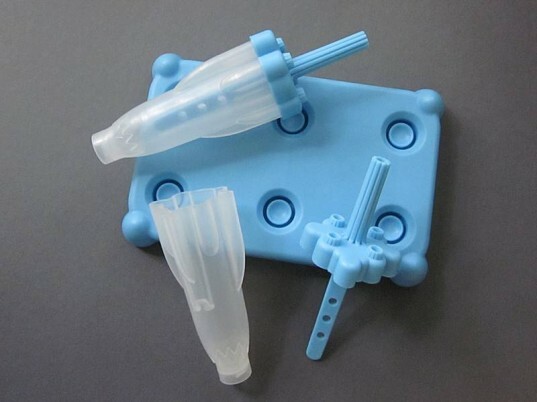 If you have younger kids, I suggest using a smaller sized mold like the Tovolo Rocket Molds shown above. See some tips and tricks related to choosing popsicle molds and facts about making homemade popsicles. This recipe will end up making about 4 to 6 popsicles. The amount you officially get will vary, depending on the size of molds you use and the amount of fruit you use. Blend your yogurt and fruit together in the blender until mixed well. Mix in the agave, ground organic flax seed and organic wheat germ. Once everything is blended well, pour the mixture into your ice pop molds. Freeze overnight. In the morning, take your popsicle or popsicles out of the freezer about 5 minutes before breakfast time. This allows your pops to become a bit soft, so when you dip the pop into the granola, it will stick. Keep in mind that huge chunks of granola won't stick to the popsicles, so place the granola on a clean cutting board and run it over a few times with a rolling pin which results in smaller pieces which easily stick to your pops. Give your child a small bowl of crumbled organic granola then let him dip his pop into the granola and munch away. Serve with extra fruit on the side if you'd like. Ingredients 1 cup of organic vegan yogurt. 1 cup of organic fruit washed and chopped. 1 tablespoon organic agave. 1 tablespoon ground organic flax seed. 1/2 tablespoon organic wheat germ. 1/4 to 1/3 cup of organic granola per ice pop. Blend your yogurt and fruit together in the blender. Mix in the agave, ground organic flax seed and organic wheat germ. Pour the mixture into your ice pop molds and freeze overnight. 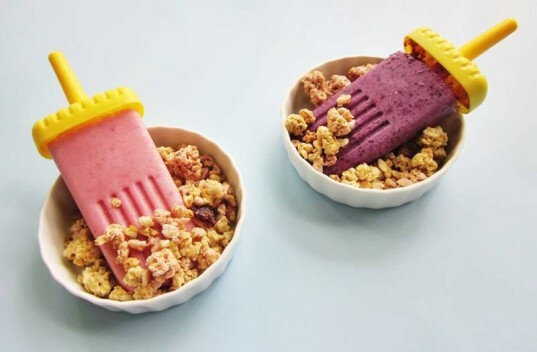 In the morning, take your ice pops out of the freezer and serve with small bowls of crumble granola for dipping.